Home / Celebrity / News / Viral / Take A Look At The $300, 000 Mansion Of Sarah Geronimo! Take A Look At The $300, 000 Mansion Of Sarah Geronimo! Last year, Sarah Geronimo was hounded with rumors that she was already living with boyfriend Matteo Guidicelli. The two were said to be living together in a condominium unit. But Matteo has denied this. Sarah does not own a condo because she already has a mansion, he says! And when you see this luxurious and obviously expensive home, you would understand. There is no way you would leave this mansion for a condo! It is reported to be around $300,000 which is roughly around 15,000,000 pesos with the current exchange rate! YouTube channel Stars Buzz posted a video containing images of Sarah Geronimo's crib. Believe it or not, it resembles homes found in Hollywood! The exterior looked clean with its white paint and an earthy, brown toned roof. The lush garden added such a vibrant color and life to the actress' beautiful house. The mansion's interior was impressive with its design as well! Everything was in place and you won't see any mess. Sarah seems to be a fan of creative furniture pieces as can be seen in her distinct lounge chairs and chandeliers. She also has numerous tables and chairs scattered around her living room. She is also not afraid of mixing different colors and patterns in one space. And it works! You get black and white plus a lot of earth tones but also gold and silver! The bedrooms found in the mansion have different themes as well but nonetheless they are all elegant. You would wish you were her guest just so you could sleep there. Her kitchen was an open space great for entertaining! It would be an aspiring chef's dream to have a kitchen like Sarah's. With her work demanding a fit lifestyle, her gym at home makes a lot of things easier. And washing off the sweat would be something to look forward to with the extravagant bathroom she has! The vanity even has it's own electric fan! Her bathroom has both a bathtub and a shower. There is also a chair you could use to chill in front of a flat screen inside the bathroom. Yes, a flat screen in the bathroom. Every area is in tip top shape and all her success ever since she started her career has led her to enjoy luxuries like this. Well deserved, Sarah! 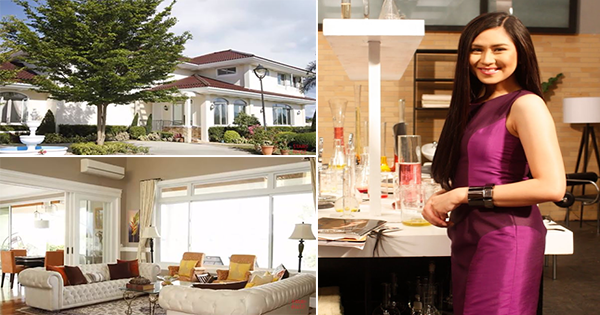 What do you think of Sarah Geronimo's house? Is it something you would want to own or would you change the design of certain areas? Share your thoughts in the comments below!